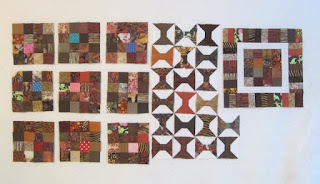 I have been playing with my log cabin blocks a little. I really like this idea of the half a block off set. It gives the colour a nice little curve of colour. These log cabins were started because of Ellison Lane quilt a long. We will see if I get it done in time or not. I have added today's post to Design Wall Monday. 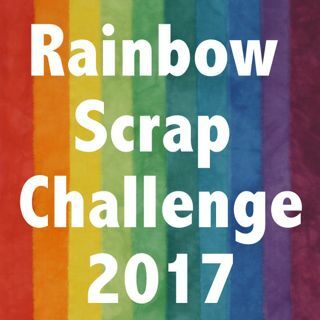 My other design wall has the last of the brown scraps still from Scrappy Saturday and the Rainbow scrap Challenge. I'm really liking those log cabins with the half drop setting -- very interesting. 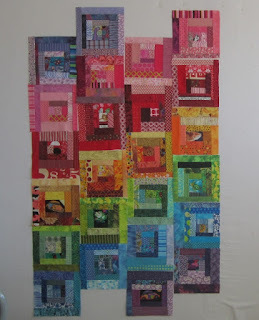 And your design wall shows you've been a busy quilter -- great stuff! What a beautiful rainbow of color. I like it! Two design walls? You are a busy, busy lady. The log cabins caught my eye. The batiks are so delicious! Are you familiar with the blog Exuberant Color? (American spelling .) Her way with batiks would appeal to you, I think. Your brown project looks nice and cozy. I love log cabins, they are so much fun to play with! Your quilt is coming along beautifully!